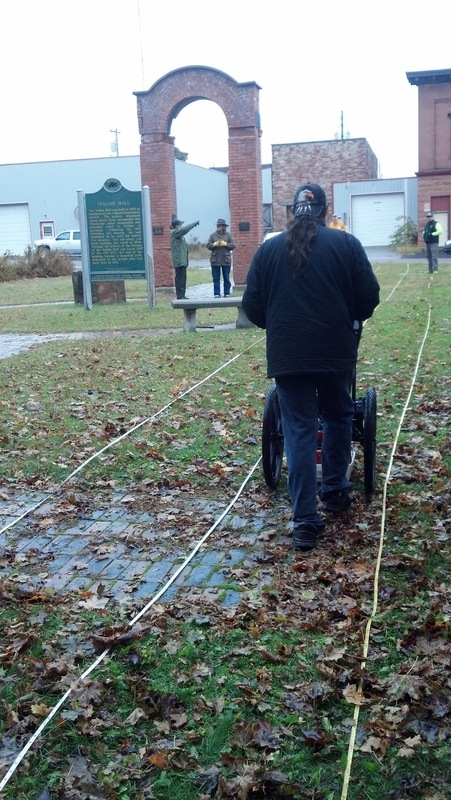 Michigan Technological's University's Industrial Archaeology program is undertaking an archaeological study of the Italian Hall site in Calumet, Michigan, for the National Park Service's future landscape improvements to the incredibly significant historical site. I (Gary) gave a presentation to the class undertaking the archaeological investigation on October 11, 2012, and stressed the significance of Italian Hall and the memorial as an important site in American labor history and that the memorial and events of Italian Hall were a part of public history that was simultaneously "contested history." History is often portrayed as the description of what happened in the past...it is understood that 'history' is more correctly described as 'histories'. If what we see and do is dependent upon our observations, then each person will have a different view of a particular event, they will construct their own history. Add to this the complexities of interpretation and language and there is likely to be no chance of there being one 'true' history. History is contingent and dependent upon the circumstances in which you find yourself, the image you want to portray and the rights you have to present your turn of the events. History is often described as the story of the winners! ...the issues at stake then are not just the accuracy of the textbooks, but the actual power and influence that goes with being the person or group that gets your story heard. It is the history of the dominant group that gets to be told and it is their story that is often the one that becomes normalised whilst the stories of others gets 'othered' or ignored. Minority groups and outcasts in society don't get to tell their story or their side of a story. As a note: our research and writing on Italian Hall aims to present the working class history associated with the site. 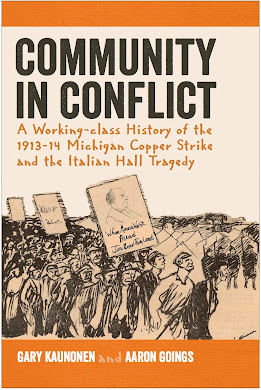 We are presenting the "other side" of the story and from the perspective of strikers, workers, and those that did not have an "official" voice during the events of the 1913-14 Michigan Copper Strike. 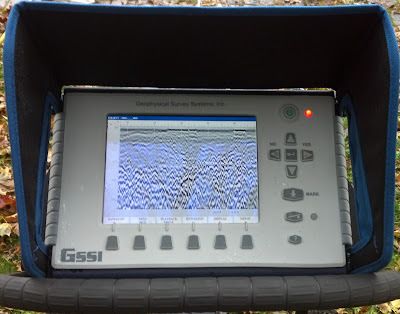 This archaeological project is a great example of public history at a contested space in that a number of agencies and stakeholders are involved in the project: local government, a state university, and a federal government agency--the National Park Service. Partnerships like these give a wide breadth of knowledge and resources to under-served, but crucial, complex historical sites like Italian Hall. Then on October 14, 2012, a morning and afternoon crew of undergraduate and graduate students in Michigan Tech's Social Sciences department laid outs lines and a historic preservation professional from the Keweenaw Bay Indian Community scanned the site with ground penetrating radar (GPR) to gain an idea of what lies beneath the surface of the ground at the tragic historical site. Doing a GPR scan of the site is the first step in an archaeological survey of the site. Step 2 happens this upcoming weekend when students will be doing shovel test pits (STPs) to check for significant historical remains on the site. This archaeological work is mandated by Section 106 heritage preservation law. This process will help Keweenaw National Park, the organization that administers the site for the Village of Calumet, determine what types of changes to incorporate for the site's landscape improvements during the centennial year of the 1913-14 Michigan Copper Strike. Pictures of this weekend's dig will be posted on the site early next week. I'm extremely excited to see what artifacts come from the STPs. This type of analysis at Italian Hall has never been done before, and promises to be an interesting and informative experience.